Your mind and stomach will question reality upon first seeing a Japanese fake food display. Whether hotdog or hamburger, risotto or ramen, it looks good enough to eat—an illusion that is only broken when you reach out and touch it, discovering the hard, plastic truth. 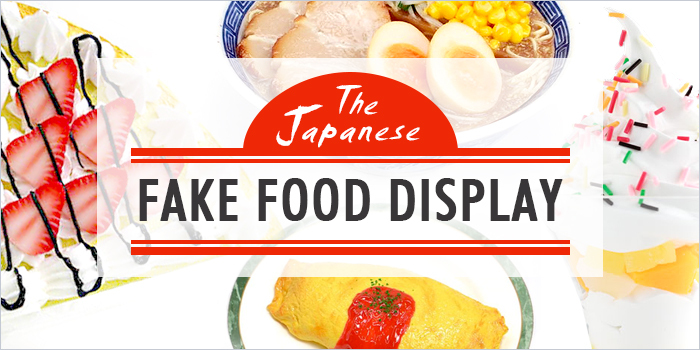 Experience the artistic craftsmanship—and fool your friends—with your very own fake food display! A stroll down Kappabashi-dori in Tokyo (or Sennichimae Doguyasuji in Osaka) and you will soon be overwhelmed by the variety and multitude of fake food items. From sushi to hamburgers you can find every food item imaginable. The demand for fake food displays comes predominately from the restaurant industry; as you can see, a lot of painstaking work goes into making each item look just right—as in, very, very real. Japanese fake food fascination has transcended the boundaries of the culinary industry; regular consumers and tourists are increasingly becoming interested in them as souvenirs. For this reason fake food gimmicks have entered the market. You can now purchase sushi cellphone charms and bacon-adorned key chains. 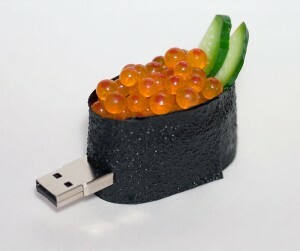 USB drives fashioned after salmon roe, egg tamago ball point pens and fake beer fridge magnets. Just to be certain each item is clearly labelled ‘DO NOT EAT’ in both Japanese and English. In some shops you can even have a go at creating your own fake food item. It’s a certainty that no trip to Japan is complete without some fake food souvenirs to remind you of this unique food custom. 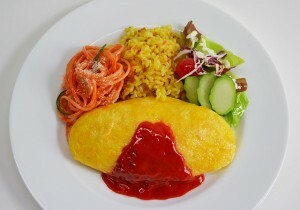 All over Japan you will find restaurant window displays adorned with glistening fake food. In most cases the replicas are so accurate they look good enough to eat. The craftsmanship behind Japanese fake food has been raised to an art form and it has become a very lucrative industry. But the artisans weren’t always crafting food; originally they were working for doctors and making models for pathological studies! 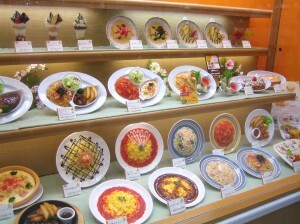 The need for fake food displays was set off during the food revolution which Japan experienced in the 1920s. Rural dwellers were flocking to the cities to experience restaurant dining and were unfamiliar with the dishes on offer. The visual aid provided an introduction to the restaurant and what could be expected from the chef before stepping inside. 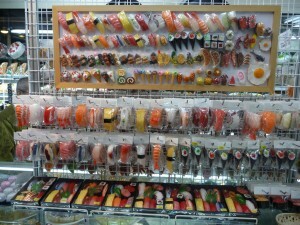 Fake food display became even more prevalent during the early Shōwa period, following the end of World War II in 1945. Americans and Europeans began travelling to Japan, and it opened up Japanese cuisine to foreigners for the first time. Not being able to read the menus meant that they were solely relying on the fake food displays to order something which looked appetizing. However, one shouldn’t make the mistake of thinking that Japanese fake food display started out purely for the benefit of wayward foreign travelers. Rather, it is believed that Japanese people have a preference of first ‘tasting with their eyes’ and so the presence of fake food is connected to the nation’s appreciation of the visual aesthetics of food. The Japanese are now so used to getting information from three-dimensional signs that it has transposed to other industries as a marketing tool for attracting customers. How is Japanese Fake Food Made? In the beginning, fake food display models were made using paraffin. But it was soon realised that the wax models weren’t resistant to heat or sunlight exposure; thus the colours would quickly fade and the model deteriorate. During the mid-1980’s manufactures switched to vinyl chloride for its lasting qualities. Even today almost 95% of all fake food is crafted by hand. Each mould is carefully sculptured to look exactly like the actual dish. In many cases, the actual cooking process is mimicked in order to get the perfect end result. Models are custom made for each restaurant and even common items like ramen will be slightly different to reflect the speciality of each restaurant. Today there are around 50 manufactures of varying size across Japan. It’s a very competitive industry with closely guarded secrets and continuous innovation. Rough estimates approximate the industry at about $60 to $90 million USD annually. Iwasaki Co., a leading maker of plastic food, employs over one hundred craftspeople who hand-paint the moulds, which can sell for as much as ¥10,000, about $100 each. Restaurants can also lease fake food displays for a cheaper rate than buying a set outright. In any case the fake food samples are worth a lot more money than the actual dish and it’s not unusual for a restaurant to spend thousands of dollars on its display food. In recent years, Japanese plastic food manufacturers have been targeting overseas markets such as China and South Korea—while these efforts have met with limited success, the Japanese fake food souvenir craze is on the up and up. To display your love of this trend, head over to FROM JAPAN’s fake food page and choose your favorite product. 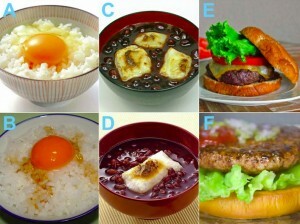 ANSWERS: A, D, E are the real foods! Like these Japanese fake foods? Check out our other article about other weird, funny, and unique Japanese oddities!